The Skinfood Freshmade Pineapple Mask contains Pineapple Extract that gently exfoliates and hydrates the skin to create a fresh and healthy glow. This wash off face mask will cleanse your skin and reduce the build up of dead skin cells using Pineapple Extract, which naturally contains PHA. Pineapple Extract also has hydrating properties to restore skin nourishment and revitalise dull, tired looking skin. 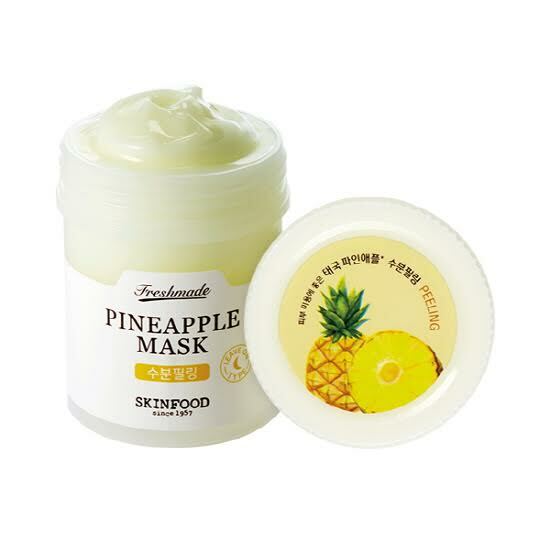 Skinfood Freshmade Pineapple Mask can be left on overnight as a sleeping mask. Pineapple Extract – rich in Vitamin C, bromelain and antioxidants. This ingredient is ideal for treating acne, reducing fine lines, and preventing sun damaged skin. It also naturally contains PHA; a gentler acid compared to AHAs / BHAs. Discover more SKINFOOD face masks here. Starting on a freshly cleansed face, massage the product carefully onto the skin, avoiding the eye and mouth area. “You are what you eat. Healthy skin starts with Food”. Skinfood’s brand philosophy drives their research & development to ensure only the highest quality food ingredients are used in their products.